I. Classical Theory of Hardy Spaces. II. Calderon-Zygmund Theory. III. Real Variable Theory of Hardy Spaces. IV. Weighted Norm Inequalities. V. Vector Valued Inequalities. VI. Factorization Theorems and Weighted Norm Inequalities. Appendix. 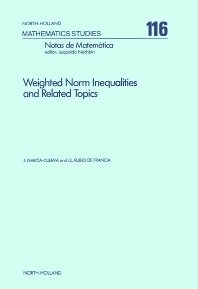 The unifying thread of this book is the topic of Weighted Norm Inequalities, but many other related topics are covered, including Hardy spaces, singular integrals, maximal operators, functions of bounded mean oscillation and vector valued inequalities. The emphasis is placed on basic ideas; problems are first treated in a simple context and only afterwards are further results examined.